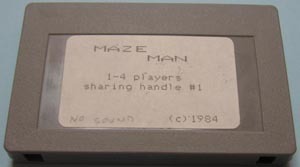 This is a review of Mazeman for the Bally Arcade/Astrocade. This review first appeared in NIAGARA B.U.G. BULLETIN, 2, no. 5 (June 1984): 22. A short while ago I had the pleasure to receive the first game release by one of the newest software sources for the Astrocade, Dave Carson. The game is called "Mazeman," and is a very realistic Pac-Man look-alike. I will have to deal with it sooner or later, so I'll make it sooner. For those of you who missed it in the ad we ran a while ago, this game is totally devoid of sound effects. This does detract from the game action somewhat, but is not as big a problem as it may seem to be. I know that it won't catch on, but the lack of sound is barely noticeable at all after you get into the thick of the game action. The graphics are well done, indeed, and I have one major question for the distributor, and/or designer of the game, "How did you ever manage to get 5 colors on the screen?" -- I swear, this really puzzles me! Most games only have 4 colors, but this one has 5! -- think about it. The mazes, and there are 12 different ones, are all rather challenging (much more than normal Pac-Man mazes) and fairly large. This is because all the walls are thinner. There are 8 power pellets, instead of the usual 4, and 4 detailed, fully animated ghosts. The ghosts aren't as "stupid" as most, either. Unlike in the "Muncher" game, the ghosts will turn and run from you if you have eaten a power pill, and are close by. The variety of mazes makes it harder to develop a pattern, so this game will stay challenging for a longer period of time than others. You are allowed to select the number of "Mazemen," and the level of play, from 1 to 9. Now I have a couple of negative things to report about the game. The one thing that I found rather discouraging was the packaging. The cartridge itself really pleased me. As a rule, with virtually all systems, third-party carts are larger than the ones produced by the company, and are harder to put in the slot, and remove. The "Mazeman" game was the exception to the rule; it was perfect! Not sticky, or loose, and a novel gray color. The label was what took me down. It was a normal, self-adhesive computer label. 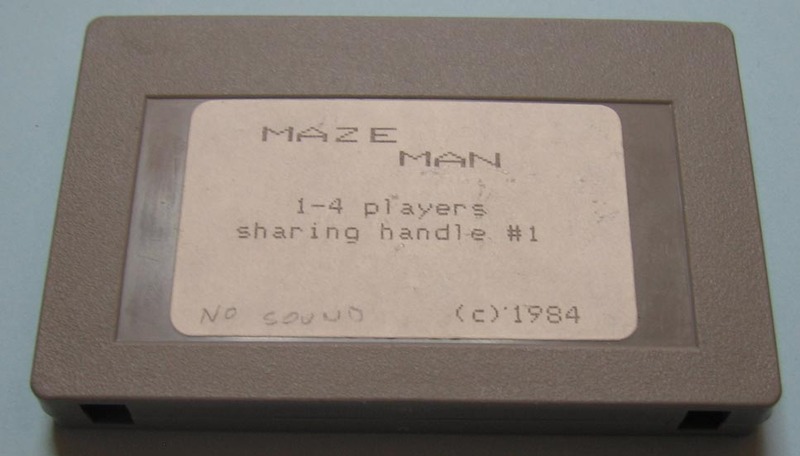 I think that "Mazeman," as a game, deserves better. Another bad point was the instruction sheet. No score table for the number of points for each item is included. I would rather not try to guess. The game itself plays well, has excellent graphics, and smooth animation, and as I mentioned earlier, stays challenging! It can be played by 1 to 4 players, with only 1 controller, because you pass the player 1 controller around. A message even comes up saying, "Pass the handle," when it is time to switch. Over all, this is an excellent buy. The lack of noise may bug some players, and you may get some comments from your friends that sound mysteriously like a [Wendy's TV] commercial -- "Where's the sound?" -- but the game itself makes up for this. Still, I encourage the designer to work on some way to include sound, because this would make this game one of the best ever! See the ad in last month's issue (page 16) for ordering information. Here is the text from a Mazeman advertisement that appeared in NIAGARA B.U.G. BULLETIN, 2, no. 4 (May 1984): 16. An ALL NEW maze chase adventure! MAZEMAN is unlike any "gobble game" you have ever seen! Each time you clear a screen, you find yourself beginning a different maze. There are 12 completely different mazes, each requiring changes in tactics. Here's a game that will not offend the non-gamers in the family. It is completely quiet. That's right, quiet! The program is so tightly packed with great graphics, smooth animation, great colors, the most precise control you've ever seen, and exciting action, that there's no room for even a simple sound routine. The game play gets so intense that you won't even notice a lack of sound after a couple of screens. If you really want to, you can always turn on the radio or play your favorite records or tapes. It might even convert some of those non-gamers! This newest cartridge game for the Astrocade system allows 1 to 4 players with only one joystick. You may program the number of Mazemen from 1 to 9. You set up each player's difficulty level from one to nine as well. The four bad guys get slightly faster and a bit more aggressive with each new maze. The mazes cycle after 12, but the increase in difficulty goes on and on. From level one through nine there are eight "Jekyl to Hyde" transformers per maze. After level 9 there are only four. MAZEMAN has challenge enough for the serious gamer, but will provide hours of satisfaction for the beginner. 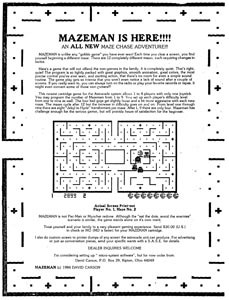 MAZEMAN is not Pac-Man or Muncher redone. Although the "eat the dots, avoid the enemies" scenario is similar, the game stands alone on its own merit. Treat yourself and your family to a very pleasant gaming experience. Send $30.00 (U.S.) in check or MO (MO is faster) for your MAZEMAN cartridge. Mazeman prototype (the background is black, not green).